The Delaware State game saw a lot of playing time for Denard Robinson and rightly so. He desperately needs the kind of in-game polish that Forcier has shown this year, and only game-time experience will help that. Against Iowa, Denard threw a fatal interception that ended the game. A lot of the talk about the pick was that he basically just floated the ball in the air, into the arms of an awaiting safety. I contend that it wasn't nearly as bad a throw as it looked (Stonum shouldn't have broken off his route), but it was still a jump ball at best. 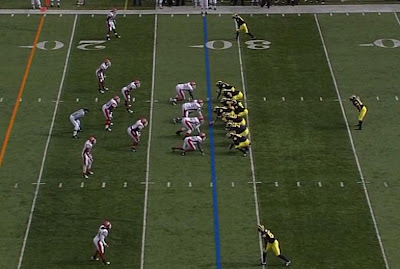 Michigan is in a three-wide set. Kelvin Grady who catches the wide-open touchdown pass is set up in the slot. 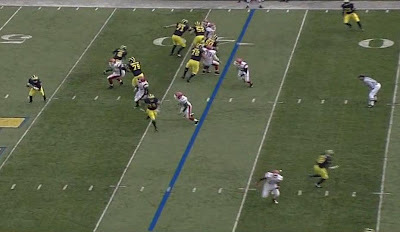 Denard is flanked by two running backs and is going to fake the zone-read before rolling out and throwing the pass. At the snap, Vincent Smith is coming in front of Denard for the play action, which freezes the linebacker. Delaware State is blitzing hard, leaving their corner backs out on an island with one deep safety. This is a naked-ish bootleg as the offensive line ends up going backside and drawing the attention of the defensive line and linebackers. The playside defensive end doesn't bite on the play fake, Kevin Grady (no L) is running into the flat for a quick release, and the playside linebacker is also crashing down on Denard. However, Kelvin Grady is running a straight fly route through the seam. His corner tried playing bump-and-run coverage but completely whiffs as Grady meets him. This route technically shouldn't be open with the one deep safety. There's no good angle to see what he does, but it seems like he is crashing down on the outside receiver, who Denard is staring at. Here, Denard sees Kelvin Grady open in a sea of turf, pulls up to get his feet, and hurls the ball downfield. Touchdown. Unfortunately, this play constitutes OH NOES. 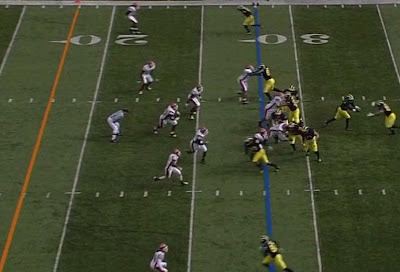 The linebacker and defensive end are on top of Denard and end up delivering a shot as he's throwing the ball. Even though Kelvin is wide open, Denard should have hit him earlier in the route, shortly after he passed by his corner with ease--that is unless the safety sat on that route for a while, which I doubt given how out of position he is here. 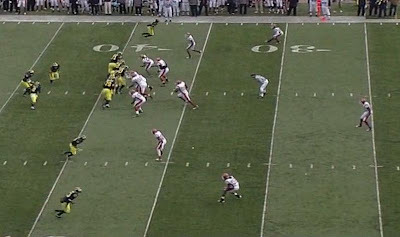 Against better opposition, Denard would either be sacked here or throw a duck into the middle of the field. The smart play is throwing it to Kevin (no L) Grady in the flat for 15 yards or so. It's difficult to criticize Denard for throwing a 40-yard touchdown to an open receiver, but the pass isn't particularly good. Not only did he probably make the wrong decision by throwing the ball deep when he was being pressured, but the pass was underthrown and lofted, much like his interception at the end of the Iowa game. The second touchdown was almost the exact same play. The second touchdown is below. This time, Denard hits Martell Webb who is lined up next to the left tackle and runs a seam route, uncovered, through the defense and into the end zone. Delaware State is playing a 4-3 and has their two safeties in the box, with man coverage on the wide receivers. 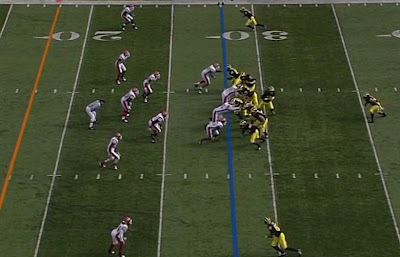 Michigan had been running from this formation the last few plays and kept running the ball with Kevin Grady. The Deleware State defense had been thoroughly lulled to sleep. Here's the snap. Denard is turning back for the play action to Grady. You can see that Martell Webb isn't even staying in to block, but releasing directly into the secondary. 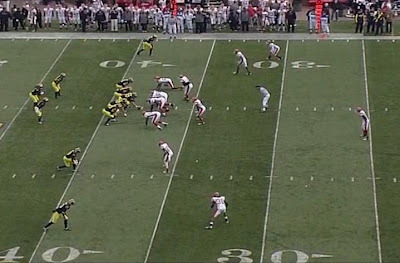 Kevin Koger is lined up on the other side of the line, blocks the defensive end so that Denard has time to roll out, and then kicks out to the flat as a dump off; he will be covered by the playside linebacker. Denard is nearing the play action, Webb is still running a seam route. The linebackers and safeties are all crashing hard on the run. Koger is still blocking but will release shortly. 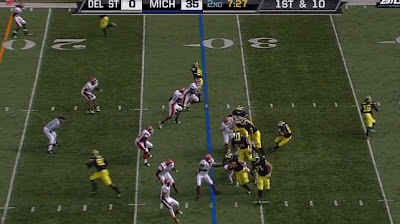 Denard is rolling out on the bootleg but has two defenders crashing on him. The rest of the defense is helplessly caught by the play fake. There's no one near Webb who will trot the rest of the way to the end zone before being hit for a touchdown. Koger has released his block and is kicking out to the flat. 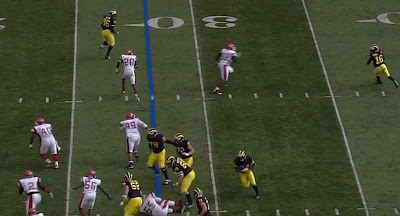 The playside defensive end is crashing hard on Denard who has squared up to throw the ball. A linebacker is giving chase to Koger who, if Denard throws to him, will likely walk up the field for 10-15 yards. This is a better pass. Denard pulls up and throws back across his body--OH NOES DENARD!!!!! (2)--while being hit. The linebackers that bit on the fake are running to get downfield and catch up with Webb who is quietly studying Gauguin's The Yellow Christ and waiting for touchdown passes to be dropped in his back pocket. 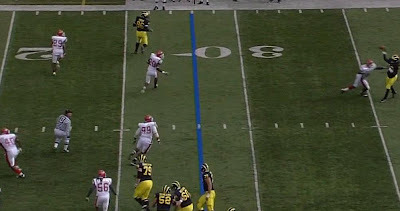 Denard throws a looping bomb that barely makes it to Webb before he lumbers into the end zone. The smart play here, even though it was another 40-yard touchdown, was the dump off to Koger because of the pressure of the defensive lineman. But what these two touchdowns and the interception against Iowa indicate is a little more bothersome: Denard is having trouble going through his reads. He knows the routes, but it seems like he has a route in mind when the ball is snapped and waits on that receiver too long. Though he went through his reads against Iowa, I'd bet he knew he was going to throw to Hemingway on that play. Simply put, Denard is trying to do too much in the passing game rather than taking what the defense is giving him. He got away with it here, but he didn't against Iowa and he won't against better competition. Now, maybe Denard took this into account when making these plays, knowing that if things broke down, he could likely get shifty with some defenders and skate out of trouble. And that's true. 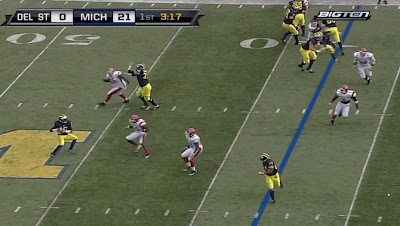 Both of these touchdowns saw Denard making cuts that the defenders just couldn't. Big Ten defenders can make those cuts. The bigger issue is the trend that we've seen with Denard and how, even in a game when he was supposed to get practice and learn to play inside the system, he portrayed these tendencies. What's worse, is that it worked, and now, he may think this is the play to look for every time. 3/4 for 80+ yards and two touchdowns through the air is great. The lessons Denard may have learned during this game are problematic though.